In May of 2010 the famous Gulf Stream, a major ocean current highway used by present day and ancient sailors for centuries, suddenly and unexpectedly shut down/stopped flowing. Why? Was the cause man-made global warming or a natural variation in deep ocean currents? Most climate scientists were convinced that this shutdown was man-made. After all it fit their climate model predictions. Predictions which indicated that as human CO2 emissions increased the atmosphere would become much warmer and damage our oceans. These climate models were purposely fashioned to mimic similar circumstances that led to the last Gulf Stream shutdown which occurred 11,000 years ago, which closely coincides with the end of the last glacial period, 10,500 years ago. Climate scientists believed that there was a cause and effect relationship between these two events. A warmed atmosphere during the last glacial period acted to melt the polar ice caps. Melt water from the ice caps flooded the oceans, including the North Atlantic. This less dense fresh water disrupted set current patterns of the more dense Gulf Stream sea water. The current disruption led to a temporary ancient “shutdown” of the Gulf Stream, which is part of the Thermohaline circulation (a system of interconnected ocean currents that girdle the planet). This ancient shutdown was portrayed in the melodramatic B thriller The Day After Tomorrow. So when in May 2010 the Gulf Stream current actually did shutdown, most climate scientists felt that model predictions had been verified. To them it was clear, man-made global warming was already melting glaciers and leading to a disruption the Gulf Stream current. Emboldened with this knowledge they immediately flooded the media with articles contending that the shut down was unequivocal proof of man-made global warming. Furthermore, they stated that world climate patterns would be altered resulting in a wide range environmental catastrophes. There were no catastrophes, and tomorrow came and went without a hiccup. The Gulf Stream current resumed its normal flow, and most importantly, a recently released research study has shown that inflow of freshwater from glaciers was not the cause of the 2010 Gulf Stream “shutdown.” Confused and dismayed climate scientists have retracted doomsday predictions and revised invalidated climate models. So what actually did shut down the mighty Gulf Stream current in May 2010? The new research study concluded that an unusual ocean water warm cell was the culprit (Figure 1). The warm cell was well defined, geographically limited, and lay directly in the path of the mighty Gulf Stream current. It acted to block the Gulf Stream current for a relatively short time period (Figure 2), then dissipated in strength at which time the Gulf Stream current resumed its normal flow. Ok…fine, a warm water cell blocked the Gulf Stream current, but what created this unusual warm water cell? Why did it dissipate? There are seemingly more questions than answers. Let’s start answering these questions by first discussing the new and revised consensus explanation of what generated the Gulf Stream blocking warm cell. Climate scientists now state that the unusual 2010 North Atlantic warm cell was the result of atmospherically warmed ocean water. Worked something like this: Man-made global warming artificially overheated a portion of Earth’s atmosphere. Energy from this warmed air was transmitted and then focused into a specific area of the North Atlantic Ocean by wind driven ocean currents. This explanation seems extremely unlikely for several reasons. First, the planet hasn’t warmed in 18-plus years, including the 2009-2010 period. There were no significant “local” pulses of high temperature air over the greater North Atlantic Ocean region during the winter and early spring of 2009-2010. Next, it seems extremely unlikely that atmospheric energy from equatorial regions could somehow be tightly bundled, and then transported great distances to a fixed and limited portion of the North Atlantic. This atmospheric energy focusing explanation of how the 2010 North Atlantic warm cell was generated is vague and at best highly improbable. A much better explanation for the origin of the 2009-2010 North Atlantic warm cell is heat flow from geological fault and volcanic regions, specifically increased heat flow from deep ocean hydrothermal vents located along a portion of the Mid-Atlantic rift system. This increased rift system heat flow acted to warm the overlying ocean, thereby generating an unusually high-temperature ocean heat cell. Result? The heat cell slowed down the Gulf Stream current in May of 2010. Additional heat flow from other areas near Lucky strike might also have been active during 2009-2010. Keep in mind these areas are underexplored and under-monitored. The southern portion of Iceland, which lies along the Mid-Atlantic Rift System, was seismically and volcanically very active during the 2009-2010 time period. The Mount Eyjafjallajokull volcano erupted in March 2010, underscoring increased heat flow from the southern portion of Iceland which is an extension of the Mid-Atlantic Rift System. Seismic activity and likely increased heat floe preceded this eruption and started in the fall of 2009. Plate Climatology Theory states that major worldwide deep ocean currents, such as the Gulf Stream, can be dramatically and suddenly affected by episodic variations in rift system geological activity (faulting, volcanism, and hydrothermal venting). Increased rift system activity equates to increased release of super-heated chemically charged sea water and associated gases (primarily CO2 and methane) into the overlying ocean. The altered overlying ocean column then acts to redirect, or in some cases stop through going deep ocean currents. The above described 2009-2010 Gulf Stream “shutdown” is an excellent example. As per previous CCD postings, it has been shown that geologically induced heat flow from deep ocean rift systems and volcanic regions east of Papua New Guinea are the likely cause of strong El Nino’s. This shows that geological activity has the power to affect major ocean currents. Deep ocean hydrothermal vents are proven to turn on and off. This perfectly explains the sudden appearance and subsequent disappearance of the 2010 North Atlantic Ocean warm cell. Turn the hydrothermal heat “on” and a fixed, intense, and blocking ”warm cell is formed in the overlying ocean. Turn the hydrothermal heat off and the overlying warm cell dissipates, thereby allowing the Gulf Steam current to resume normal flow. A simple, believable, and very specific explanation. No catastrophes, no complicated current or wind transfer of energy into distant deep ocean regions. Climate scientists have long cited atmospheric changes in wind and temperature as the cause of “unusual” natural variations in currents. It is here contended that these atmospheric changes are often the effect, not the cause. 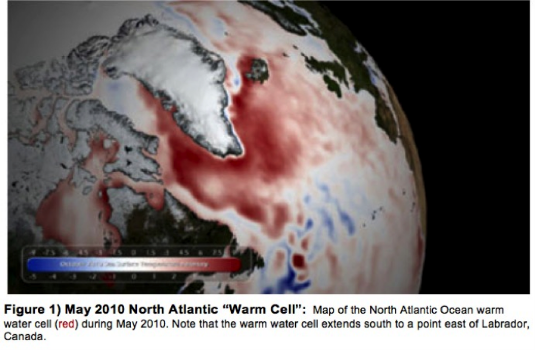 Atmospheric changes associated with the 2010 warm cell where “effects”, not “causes” of the warm cell. As a general comment, it is fair to state that climate scientists are “atmospherically” biased. They often force fit data and observations into an atmospherically based global warming context. It is what they know. It’s what they were taught, and lately it is very unfortunately what they are mandated to think. Challenging the consensus atmospherically based global warming theory is not only discouraged, it is apparently now illegal. Man-made global warming was not the cause of the May 2010 Gulf Stream shutdown. Strong evidence shows that the cause was geological in nature, specifically heat flow from a portion of the Mid-Atlantic rift system. This adds yet another level of credibility to the theory of Plate Climatology.